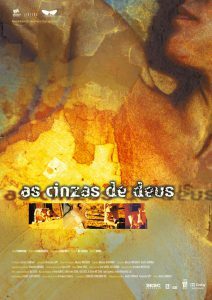 As Cinzas de Deus is a visual poem in a universe of realities. Set in the ruins of an abandoned, once grandiose city in Brazil, the film follows a woman, Helo, returning to a world of memory and feeling, where ‘trapped souls’ are living and re-living moments from an unspecified past. In search for answers and completion Helo penetrates their dream-like reality, absorbs them, challenges them, releases them. Their memory bank gradually erased, they disappear into the ether. In a climactic finale she confronts her own personal nemesis. She survives the life-and-death confrontation, and, left behind, she dances alone, immersed in dust and eternity.